What the heck. I’ve been called worse names in the past. In school..at certain family gatherings…My Murphy ain’t so bad. I’ve found another problem that I have and in making this one better I may have actually made it worse for myself. I’m an obsessive weigher. That means I weigh myself every day. I can’t wait until the end of the day to hop on the scale and see the results of the day’s consumption. I know it’s recommended to just weigh yourself once a week or every now and then so you’re not obsessing and so dependent on the numbers. However, I still do it every day when I’m near my home scale. Therein is the start of this problem…my home scale. It’s one of those standard spinning wheel scales that is never quite perfectly accurate. That really doesn’t sit well with me when I’m into daily weighing and having the up to date accurate weight. On those old spinning scales you turn the wheel to calibrate the scale to zero before you get on. And the scales are so unreliable and cheap that you have to calibrate it every time you use it…this is annoying. You set it and step on it and when it returns to zero it’s always a pound or two off in either direction…so you never know if your weight is really your weight. My remedy for this is a technique I call average weighing: I hop on and off the scale four or five times and take the average weight. To me, this is borders on OCD…like those folks who have to open and shut a door 3 times every time, or wash their hands impulsively. In addition to the obvious obsessive issues with hopping on and off the scale, I truly am never happy that I have an accurate weight reading. My solution to this is to buy a digital scale. There’s no calibration necessary and it spits out an accurate to the ounce weight. There’s no more staring at the dial wondering what pound the needle is on and if it’s really accurate. Now I can hop on just one time and in less than five seconds I see my digital weight. This of course has now brought up an additional concern for my over analytical mind…a Catch 22 of sorts: the digital scale may be too accurate. It’s great that there’s no guesswork because the digital scale is never fail and always on the money, but it may be so great that there is no guesswork. The spinning scale with all it’s faults and inaccuracies at least left my exact weight open to interpretation…an interpretation that usually put me on the lower end of the average weight. Now however I get the weight with no interpretation needed and no second guessing possible. And this new digital scale has started me off about 2-3 pounds higher than my old scale…I’m not sure I like it right off the bat. On the technical side however, it’s got a big blue indigo glowing display that’s mesmerizing to look at…and the scale itself is bigger so all of my feet stay on it. Interns no more – residents round here! Oh no – after all this??! Careful – when you get what you wish! I want my Seattle Grace!!! Really did it this time. Moving too fast….loading briefcase quickly….hand grazes the edge of top heavy coffee mug….mug is full….coffee spills….lands in briefcase…Murphy spews unintelligible words, and several choice very clear words. Just one of those moments that makes you ask “Why?” about 15 times before you realize, IT WAS JUST AN ACCIDENT. But before you come to peace with it, you mentally hit yourself with the questions… If I had only moved a little slower, not been distracted, or whatever. Just that strange little self torture ritual you go through when something like this happens. Fortunately it didn’t hit the laptop ( as you can tell, I am typing without missing letters . It did get my glucometer, a few papers, and most of the back pouch. I got stuck with one of those “Pay It Forward” things the other morning and it caught me completely off guard…almost like getting snuck up on in game of tag…blindsided…didn’t see it coming. BUT, I only have myself to blame for creating the conundrum. When you head in to work at 4:15 in the morning, there are usually no surprises: same route, same timing, same cars on the road, nothing new EVER. On this particular morning I was feeling a bit draggy so I decided to do something that I’ve never, ever done. I pulled into the all night gas and food store for a large caffeinated beverage. I’d never been in this store before so I had to get my bearings and figure out which humungo sized cup was the best deal. I settled on the 32oz. Diet Coke fountain drink…only 99 cents…WHAT A DEAL! I rarely go into these places so I didn’t realize you could get a bucket of fountain drink for so cheap. Anyway, I loaded up my cup and headed to the cashier. She looked at me and asked if the 99cent drink was all I had. Yep, that was it. “Oh, well just go ahead then” she said. That caught me off guard. I gave her the early morning, groggy “huh”. She repeated that I didn’t have to worry about it (paying for it) just take my drink and go and have a good day. This was a sweet little surprise because I already had my dollar and change out to pay for it. What a great way to start a day…a free drink. It was only a buck but free is free…period. I grabbed my drink, thanked the cashier and left the store. Then like a ton of bricks it hit me. Instead of relishing the free drink and $1 savings, I’d been tagged with a “pay it forward”. The right thing to do wasn’t just to relish the freebie, but take that dollar that was set aside in my pocket and use it to spread my good fortune to some else. At work I waited to spread the joy. Jodi presented the first chance…she was looking for 50cents for a Coke. TADA. I offered her the dollar and she gave me the skeptical eye. She didn’t even want to touch the dollar I was offering…assuming I was up to something. It took some convincing and explaining but she finally took it and bought a drink. She brought back the extra 50 cents so that I could pass that on as well. So that one good deed from another has begat two good deeds from me. It’s a famous line from the Graduate and last night, as I stared inside my cabinet, I realized it was so so true when it comes to – of all things – cups. As a kid we always had glassware in the cabinets. We usually had the “good” set that matched and which was used for the family gatherings when I guess we needed to put on airs that we had a matching 12 piece set of Libby smoked beveled glasses. On the other regular days when it was just the four of us, we used-as I assume all American families in that time period did-character glasses from McDonald’s, Burger King or jelly jars. We had a few Star Wars and Mayor McCheese glasses, a Hamburglar and Smurfs and various other “collector’s edition” glassware. I tell you, as a kid that term “collector’s edition” really did the trick. You saw that commercial of the Darth Vader glass during the Saturday morning cartoons and the rest of the day was spent concocting schemes and logical reasons to convince mom why we couldn’t go another day without it…or the R2D2 glass that was coming next week. After all, you had to collect all 8 and I guess wait for the day when Sotheby’s rang up asking to auction them off for a king’s ransom. Only now as an adult do I realize “collector’s edition” meant only 20 million were made. Oh well, I couldn’t tell you where the sets are now anyway…garage sale fodder at come point I assume. At some point in my childhood growing up in New Orleans, a new creation began to gradually ease in on the collector’s glass space of the cabinet…the ever popular Mardi Gras cup. These 16oz., colorfully decorated, Krewe themed cups were everywhere. 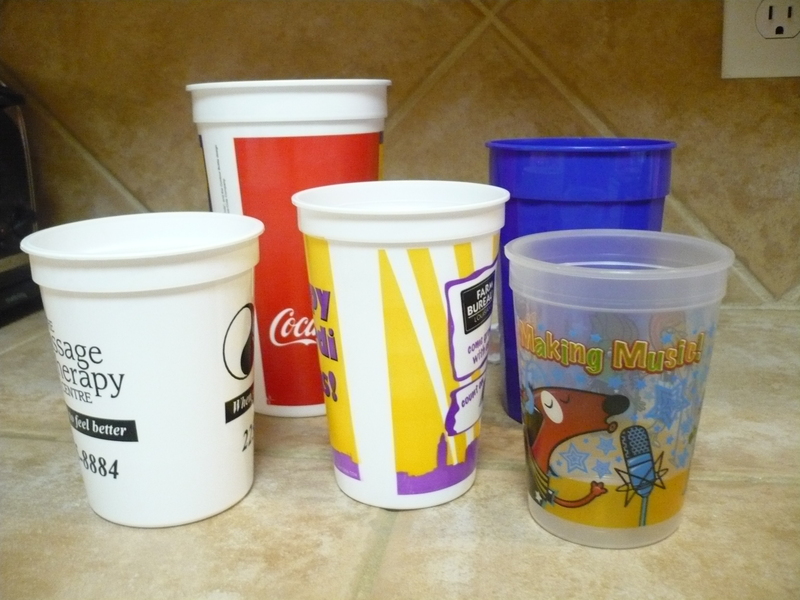 At one time I was even collecting these…cheap plastic cups and I killed for them. Only now do I realize after buying them in bulk myself that they sell for a dime a piece or less. What a foolish child I was. I also now realize the Mardi Gras cup as I knew it has various monikers: some call it the “go cup”…as in taking your drink to go. Some of you call them “stadium cups” because that’s what they sell drinks in at the stadium. Some of the lesser cultured just slap the all encompassing “Dixie cup” or “Solo cup” name on anything plastic. I guess no matter what you call them, we all kinda know what each other is talking about. As an adult I have vowed on many occasions to never ever purchase a “collector’s edition” character glass from anyone. And I’ve also tried many times to rid my cabinets of the plastic cups. However, like rabbits they seem to multiply until one day I’ve got 4 dozen of them in various shapes and sizes. Now mind you, I have my matching glassware set that we use on a daily basis…no putting on airs just for relatives here. It’s a standar set I got at either Wal Mart or Target and it does the trick…they are clear and plain…not smoky or blue or green tinted. The concession I’ve made to the plastic cup use is for quick drinks here and there, picnics, the kids and their friends hanging out and other such casual use. Hey, if someone takes one or you lose one, it’s no biggie…I’ve got a million more. This brings me back to the look in the cabinet that spawned all this. I actually found myself snobbishly choosing one cup over another. Then I stopped and realized that I do this all the time. These cups all elicit different feelings in me, they’re used for specialized occasions and they can affect my mood…cheap plastic cups for God’s sake! Need an example? I have a few gigantic 32oz and 48oz monsters for grass cutting and other hot outdoor events like relaxing at the pool(the big ones are also good for washing dirt out of the tub). I have the smaller 8oz sized ones that were usually kid’s meal cups from restaurants…these are good for a quick sip to wet the whistle, or take medicine or even when 6 teens descend on your house from bike riding. Then of course there are the standard 16oz models from certain places or events I hold dear. I even have the 20-24oz size when you just want something a bit more than 16oz…like maybe a rum and diet Coke.